Students at Georgia State’s Perimeter College will soon have access to a new food pantry, thanks to Dunwoody campus professor, Dr. Crystal Garrett. Garrett said she was conducting research last summer when she came across an article about the growing number of homeless and food insecure students on college campuses. 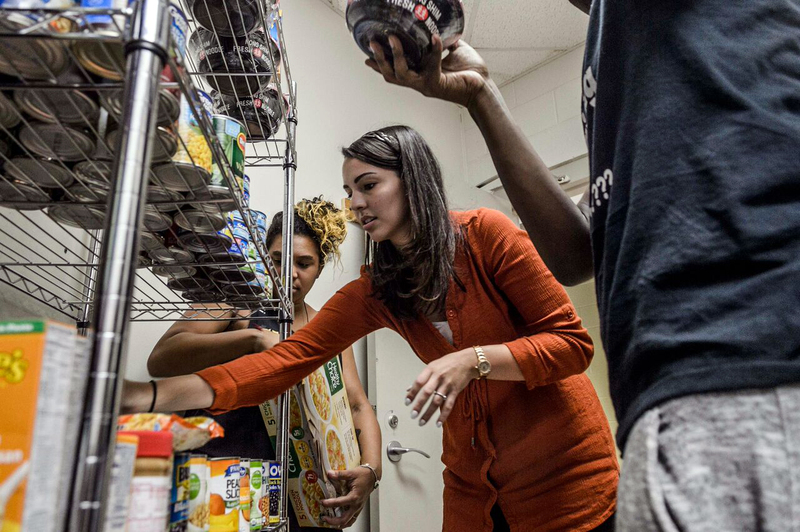 She was heartbroken after reading the article and decided to kickstart the process of opening up a food pantry on the Dunwoody campus. Garrett first had to gain approval from Georgia Perimeter’s Dean, Peter Lyons, and Associate Dean, Susan Cody, before starting up the pantry. She then found a location, set up shelves and began collecting food items during the fall 2017 semester. The food pantry will be open April 11 and will be located in an old janitorial storeroom near the rear parking lot. All students need to be able to benefit from the pantry is a valid Georgia State student ID. Students are going to be in charge of keeping the food pantry up and running, while Garrett is in charge of overseeing the pantry. Garrett said volunteering for the pantry is a great opportunity for students to gain work experience and learn how to run a nonprofit organization. Any student, regardless of major, is welcome to volunteer with the food pantry. Monach meets with Garrett in his spare time and brainstorms ways to improve the pantry, as well as ways to help spread the word to the students and organizations on campus who are willing to help out. Monach believes the new food pantry will be a great resource for Georgia Perimeter students to turn to in their time of need. “Some students spend a large amount of money on their education, thus surrendering some of their nutritional needs in hopes of a better education. Hopefully this pantry will lighten the load on them a little,” he said. Kiawu wants other students to know this is an important issue and that they need to be aware that their classmates are in need. “This food pantry should be a call to action for those who are willing to serve and assist their fellow students,” Kiawu said. Monach said that, even though a student might not be affected by homelessness or food insecurity, they might know a fellow student who is, which is why it is important to spread the word. “It needs to reach the ears of those who can benefit from this,” Monach said. In addition to spreading the word about the food pantry, there are bins placed around the Dunwoody campus until the end of the semester collecting non-perishable food items and toiletries to help stock the pantry. The pantry currently has three shelves full of items, but is always looking for more in order to replace what is being given out. So far, the food pantry has only received donations from students, but the pantry is also looking for school organizations to help donate, as well as more student volunteers to help keep it operating, according to Garrett.